NEWMARKET, Ontario, June 1, 2010 – On Saturday, May 29, the Town of Newmarket received a CH2M HILL Sustainable Community Award from Federation of Canadian Municipalities (FCM), Newmarket was recognized for the Town’s Leadership in Energy and Environmental Design (LEED) Platinum certified subdivision. The Sustainable Community Awards are open to municipalities and their private sector –partners for projects of national significance that demonstrate innovation, excellence and environmental responsibility. 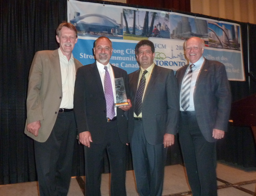 The Town of Newmarket and its partner, Rodeo Fine Homes, were recognized in the building category. Newmarket’s 34-lot EcoLogin subdivision is the first subdivision is the first subdivision in Canada to receive LEED Platinum certification from the United States Green Building Council and the Canadian Green Building Council. Some of the advanced green features include rainwater collection to flush toilets and irrigate gardens, super insulation levels, draft-proofing, heat recovery for ventilation and drain water, high efficiency appliances and lighting, ultra low flow fixtures, sustainable harvested wood throughout, low Volatile Organic Compound (VOC) finishes, and solar panels for space and hot water heating. In order to lead the way for other municipalities and developers that are interested in creating this type on environmentally sustainable housing, a detailed manual has been created which outlines the steps that were taken to develop these innovative homes. The manual can be obtained by contacting the Town’s Building Department at 905-895-5193. This is the second time in three years the Town of Newmarket has received a Sustainable Community Award. In 2009, Newmarket along with Aurora, East Gwillimbury, Georgina, King and Whitchurch-Stouffville was recognized in the waste management category for its collaborative was collection contract and implemented of the green bin program. Over the past 10 years, the Federation of Canadian Municipalities’ (FCM) Green Municipal Fund (GMF) and CH2M HILL have been recognizing municipal governments across Canada with Sustainable Community Awards for leadership in environmental excellence and innovation in service delivery. Along with environmental benefits, winning projects demonstrate the economic and social advantages of sustainable community development. This entry was posted in News on June 1, 2010 by admin.